In September Crysalis records will released "Legend", a 20 track Suzi Quatro compilation album. Suzi Quatro has been heavily involved and has chosen the tracks to be included, so you get the obvious tracks - the hits such as "Can the can" and "Devil gate drive" as well as some less well known songs that are either her favourites or tracks she feels are important. The album is being released on CD and vinyl as well as download, and the liner notes feature an extensive set of notes about each track. In addition there's more good news for Suzi Quatro fans. Currently her albums "Suzi Quatro" and "Quatro" from 1873 and 1974 respectively, are the only albums of hers that are available digitally, but Crysalis are going to be making remastered versions of four more albums available on legal download and streaming services. Those four albums are "Your mamma won't like me", "Aggro-phobia", "If you knew Suzi" and "Suzi...and other four lettter words". The remastered songs on this album sound great. The song selection is fantastic - the hits are obviously the ones everyone knows and there can't be many people over a certain age that don't remember seeing Suzi Quatro on Top of the Pops performing "Devil gate drive" or "Can the can", and those songs will obviously tempt people to buy this compilation album, but they'll soon find that the hits are far from the only great songs included. I've thoroughly enjoyed listening to this album - I knew quite a few of the songs but have enjoyed hearing some songs I didn't know. 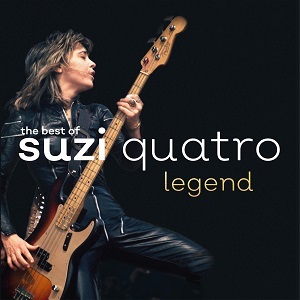 If you don't already own a Suzi Quatro compilation then this is definitely worth a purchase. Suzi Quatro will be touring the UK as part of the Legends tour with Hot Choclate, David Essex and The Osmonds.